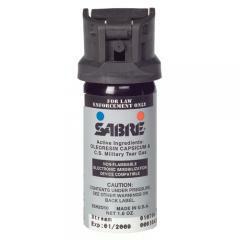 Non-lethal suspect detention just got safer thanks to the Sabre MK-2 H2O Stream Delivery Spray. Featuring a new water based formula, the spray can now be used without fear of combustion or flammability. This means that it can be used safely in conjunction with electron discharge weapons such as tasers. With a potency of 1% OC, this spray delivers the stopping power needed to immobilize the toughest assailants. The fast acting spray immediately inflames the throat, eyes, mouth and nose to cause instant disorientation that allows the user the time to take appropriate action. Because of its water soluble base, the areas where the sprays has been used are easier to clean and decontaminate. A nitrogen powered propellant system prevents freezing so that the MK-2 can be used in any environment.